Satara district superintendent of police Sandip Patil received minor injuries when confronting a mob. PUNE: The agitation for quota for the Maratha community turned violent in Satara city in western Maharashtra today, with protesters disrupting the traffic on the Mumbai-Bengaluru highway. "I received minor bruises, but I am completely all right," Patil told PTI, adding that police were clearing the highway. Police fired tear gas shells and used baton-charge to disperse the protesters, said another officer. "Agitators turned violent on the highway near the city, pelted stones and damaged a police vehicle," he said. Local media reports said that protesters stopped local NCP MLA Shivendra Raje Bhosale when he tried to address a gathering during the protest march taken out by Maratha organisations in the city. 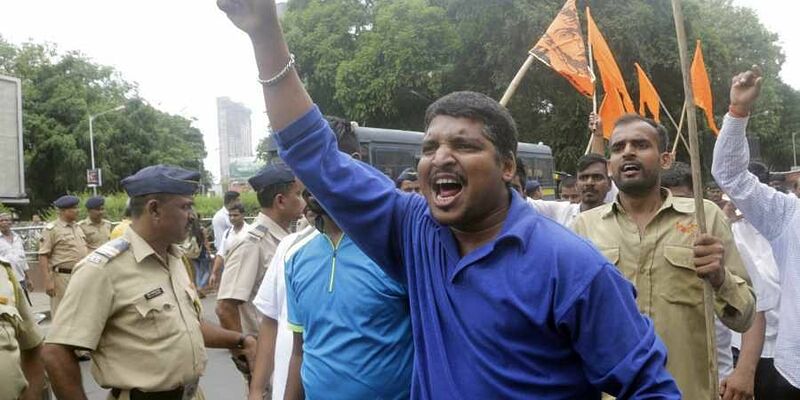 Organisations such as the Maratha Kranti Morcha and Sakal Maratha Samaj called for a Bandh in Mumbai and surrounding areas today to press the demand of reservation for the Maratha community in government jobs and education. The agitation has spread to other parts of the state too.